Post 56. Love and an empty tank. After our time in Durban, Wilf and Val drove us back to Johannesburg. We drove into Rig and Sue’s drive way, happy to be back. As Val got out of the car, Nelson, their huge Newfoundland, walked up to her, cocked his leg, and wee’d all over her, from her waist down. She felt so welcomed. A week later, Cathie, Barry Poppleton, Tony and I decided to drive down to Cape Town for Christmas. It was a long 16 hour drive and the guys took turns at the wheel. There was plenty of time to talk and we had fun trying to keep the drivers awake along the dead straight, nothing-in-sight roads. We stayed in some student’s accomodation having braais and lots of people around. When Christmas came, Tony’s chef hat went on. He decided to do a roast leg of pork. We didn’t know Cape Town at all, so we drove around for ages trying to find a butcher. We found ourselves in what felt like an unsafe area. Tony went into a small butchery and asked for a leg of pork. He came out, without a leg, looking a bit shaken. It was a Muslim butcher. We laughed and drove off quite quickly. We managed to find our leg somewhere else. He did the whole thing; tooth-picked bits of pineapple and cherries all over it, crackling and apple sauce. It was delicious. I was impressed and told him I was marrying him because he could cook. Gill Coetzee and Shena were also there. Gill was funny. If there was anyone I could imagine having tea with the queen, it was Gill. She reminded me so much of Julie Andrews in the Sound Of Music. During one of Rigby’s preaches, he had thrown out the question, “What would you do if you had a million rand?” Gill, who was single at the time, stood up and replied, “I would get someone to marry me for my money.” We nearly died. I first met Shena and her identical twin sister Alanna at Mitchell Girls High School. They were the hippy art teachers who turned the school upside down with their radical faith. So many girls had came to Jesus through their lives. Our drive back to Johannesburg was interesting. We ran out of petrol about 3/4s of the way out of the Karoo Desert. Tony was driving and I was supposed to be sitting in the passenger seat. It was too far away so I sat on the little seat right next to him. It was the middle of the night and there was nowhere to get fuel. There was no way we wanted to breakdown in the pitch dark. We prayed we would make it. We talked for hours. Tony told me his whole story again with other things he felt he needed to tell me. I listened and asked questions all through the night. He wanted to tell all and then give me the option to change my mind. I felt the need to tell him that there was longevity in my family and that I might be around for a very long time. Did he want to change his mind? Neither of us did. Before we knew it we were out of the Karoo and at a petrol station. We had driven on an empty tank and love and fresh air, for hours. 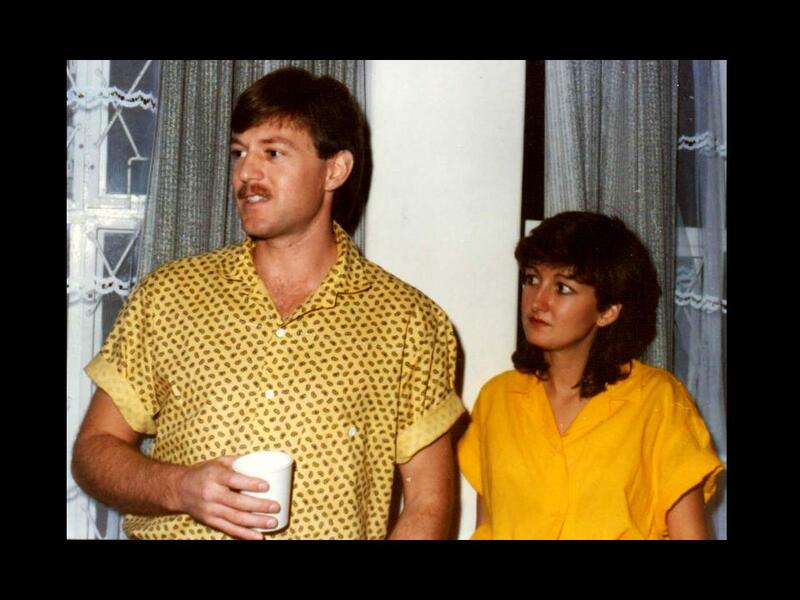 My fiancé, Tony, who I had never been with, arrived in South Africa in December 1985. We had been pen pals for a year and a half. Cathie Beattie came to our house early that morning. She was almost as excited as I was. I filled up the bath and was happily soaking in my bubbles when she knocked at the door informing me that the plane had landed. We weren’t far from the airport, but I was still pushing it. I had been day dreaming; imagining what I was going to do when I saw Tony. We were engaged, but we had never been together. I pictured myself putting my hand out and saying to my fiancé, “Welcome to South Africa.” Just thinking about the whole thing got my tummy going and by the time I left the house, I had the runs. I was so nervous. Rig drove me to the airport and Cath sat on the backseat smiling from ear to ear, trying to calm me down. As soon as we arrived, I bought some gum and then ran off to the loo. Rig and Cath waited in the car outside. When I came out I saw Tony looking around for me. He looked so handsome. I crept around behind him, put my arms around his waist and said “Welcome to South Africa.” He turned around, we looked into each other’s faces, smiled and hugged and kissed. It was as if we had always been together. We walked out to the car where Rig and Cathie were waiting. I introduced them all and off we drove, chatting about his trip. We found out why he arrived wearing such a heavy sweater. He had been travelling for days and wasn’t able to wash anywhere. He was wearing it to hide any B.O he may have had. I had found a small garden cottage for him, just up the road from the Wallace’s place. It was tiny and perfect. I filled up the little fridge with food and he was so happy. My friends loved him. He found Waverley quite unusual. The first Sunday he was there, Marie Dunn linked arms with him and swung him around during the one of the songs. That was a first. Strangers kissed him on the mouth in typical South African style. That was another first. In a few weeks we had our official engagement party at the Wallaces place. Everyone knew we were heading off to India so we didn’t get a lot of gifts and there was still no ring. After a month of being in Johannesburg we took our first train trip together. Tony was going to meet Wilf and Val and the rest of the Lowe family in Durban. A friend of ours offered to give us a lift to the station but didn’t tell us he didn’t know how to get there. We got hopelessly lost and missed the train. We rushed into the Station Master’s office. There was a group of tourists who had missed their connection and there was a bus taking them to meet the train at the next station. We got on the bus then boarded the train, huffing and puffing. There was an excitement about the edginess of the whole thing and we loved that our lives together had started that way.